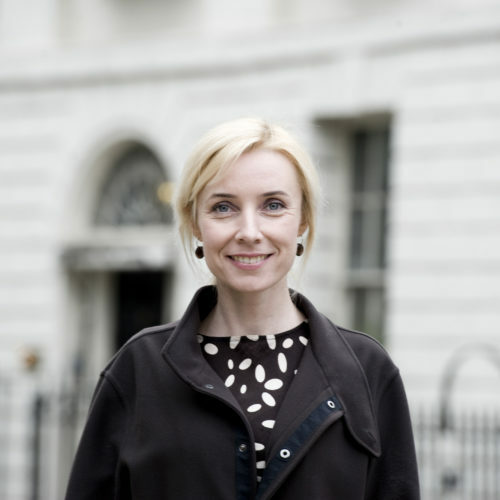 A century and twelve years ago, an aristocrat and her middle class husband moved into number 44 Bedford Square. A century and six years later, an admirer of this aristocrat founded a college in her house’s mirror image on the square’s Northern side, and named its academic salon after her. What had she done to deserve this honour? Lady Ottoline Morrell was what modern jargon would call a facilitator, and the Edwardians called a patroness. In Bedford Square, and at her country house in Oxfordshire, she hosted artists of many kinds – introducing them to each other, giving them presents, and offering her friendship. They included Henry James, Roger Fry, Duncan Grant, Augustus John, Dorothy Brett, G.E. Moore, John Singer Sergeant, G.K. Chesterton, Hilaire Belloc, Jacob Epstein, Walter Sickert, Lytton Strachey, Mark Gertler, Aldous Huxley, T.S. Eliot, Dora Carrington, Bertrand Russell, D.H. Lawrence, Duncan Grant, W.B. Yeats, L.P. Hartley, Henry Green, Stanley Spencer, Vanessa Bell, and Virginia Woolf. For many years this hung, in the ante-chamber to the National Portrait Gallery’s Bloomsbury room, alongside three vast group portraits of First World War generals. This astute piece of curation acknowledged several things simultaneously: that she liked male company, opposed the War, was excluded from the Bloomsberries’ inner circle, and was represented by them as grotesque. The most negative of her many literary representations is Hermione Roddice in Women in Love: ‘She was impressive, in her lovely pale-yellow and brownish-rose, yet macabre, something repulsive’. After reading the novel Ottoline broke off relations with D.H. Lawrence for a decade. Why did they ridicule her? Miranda Seymour, in her excellent 1992 biography, suggests that they placed a premium on a kind of integrity which was violated by her attempted discretion about her affairs (notably that with Bertrand Russell). She was Christian – which was passé. She was aristocratic, which was also kind of passé, as well as being a social aphrodisiac. 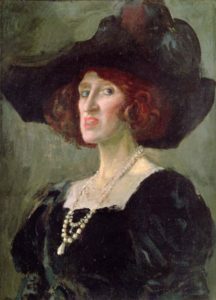 She exaggerated her pre-Raphaelite looks (a six foot figure, turquoise eyes, large features, and red hair) with high heels, large hats, and theatrical clothes. She could embarrass her friends with gifts, and oppress them with the urgency of her friendship. The purity of it carried away the doubts. It is not an easy thing to have met across the great gulf of the world, conventions and positions, etc. But – I jumped and he jumped and we both stand on an island of the soul. I used to call for a lover, and now God has sent him…I have loved to give – now I am allowed to receive. It is a miracle. Shortly thereafter Lionel Gomme died in her arms of a brain hemorrhage. She was a liberal in politics, and strongly supported her MP husband. She was a gifted designer of interiors and gardens. She was in pain for much of her life (and died of cancer in 1938), but dealt with grace with both this and the financial problems which forced her to downsize from Bedford Square to Gower Street in 1927. Late in life, Virginia Woolf came to recognise these qualities, and to repent of some of her former ridicule. The lions were there all right. Yeats, Sassoon, and the rest – but they were not on show, not caged. Rather I saw them in their natural haunts, relaxed, unobserved, at play; or, if they wanted to work, free to go and to do. Ottoline, far from being a lion-huntress…was a lion herself, a creative artist of the private life…In the company of her distinguished friends she seemed of their spiritual kin, and in force and originality of personality wholly their equal. One looked at her and listened to her and remembered her as much as them. After her death Augustus John described her as: ‘A most noble and generous soul…there is no one to be compared with her’. Aldous Huxley said that: ‘She gave me a complete mental reorientation’. Henry Green wrote: ‘No one can ever know the immeasurable good she did’. We can’t, but we can guess. And we can and do honour her.